Mattis: US To "Annihilate" Islamic State Caliphate, Civilian Casualties A "Fact Of Life"
US Defense Secretary James Mattis announced plans on Sunday to ‘Take Apart’ Islamic State Caliphate. Civilian casualties do not matter one bit. The fight against Islamic State has shifted to “annihilation tactics” to stop potential terrorists who’ve flocked to places such as Iraq and Syria from returning to their home countries to wreak havoc, Defense Secretary James Mattis said Sunday. “We are going to squash the enemy’s ability to give some indication that they’re — that they have invulnerability, that they can exist, that they can send people off to Istanbul, to Belgium, to Great Britain and kill people with impunity,” Mattis said. He said the U.S. plans to “strip them of any kind of legitimacy” and deny any country from providing Islamic State with any degree of protection as well as dry up the group’s fundraising. The Intercept reports THE U.S. HAS RAMPED UP AIRSTRIKES AGAINST ISIS IN RAQQA, AND SYRIAN CIVILIANS ARE PAYING THE PRICE. ON APRIL 24, a group of Syrian women bundled themselves and their children into a car and attempted to flee the small town of Tabqa, outside of Raqqa. In recent months the sleepy principality had become the site of raging battles between Islamic State militants and U.S.-backed proxy forces, waging a campaign to drive ISIS from the country. Packed into the fleeing car were 11 people, including eight members of the al-Aish family: three women between the ages of 23 and 40, and five children, the youngest one just 6 months old. “A U.S.-led coalition warplane targeted heavy machine guns at civilians trying to flee the city of Al-Tabaqa, which is witnessing heavy clashes between gunmen,” reported the local anti-ISIS activist group Raqqa is Being Slaughtered Silently. The air raid led to “the death of a whole family.” Following the attack, photos of the young children from the al-Aish family circulated widely on social media and local news sites, including pictures of 3-year-old Abdul Salam and 6-month-old Ali. The strike that killed the al-Aish family was just one of an estimated 9,029 strikes carried out by the U.S.-led coalition in Syria since 2014. The independent monitoring group Airwars estimates that coalition strikes in Syria and Iraq over the past several years have killed between 3,681 and 5,849 civilians, compounding the suffering of people who have already endured years of civil war. In recent months, local media have reported a steady stream of airstrikes that have hit civilian targets, including several particularly egregious strikes on packed schools and mosques. But worse days for civilians in northern Syria could still be ahead, as the United States and its allies prepare for a terminal offensive against Raqqa — the last urban stronghold of ISIS and the capital of its deteriorating proto-state. 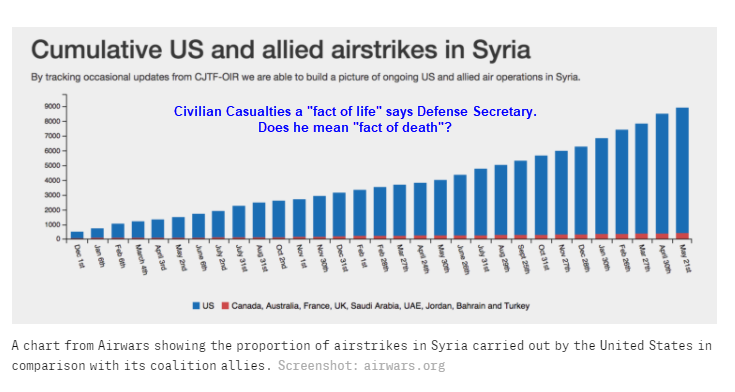 Civilian casualties “are a fact of life”. Time to "annihilate" ISIS says Defense Secretary, Agree or Disagree?